'You're telling me the king of a third world country runs around in a bullet proof catsuit?' 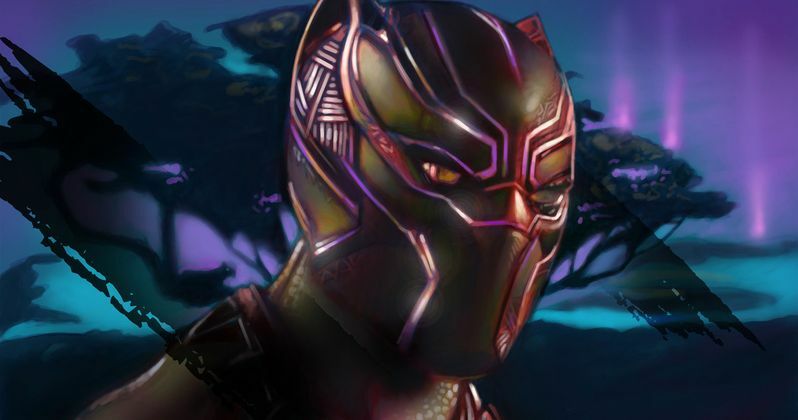 Last night, during the 2018 National Championship Game, fans got a special, brand-new look at Marvel Studios' Black Panther. It's a powerful sneak peek at what's to come next month when the MCU unleashes it's first of three new movies in 2018. Tickets for Black Panther are now on sale and available wherever tickets are sold! Marvel Studios' next big adventure is tracking to be one of the biggest Marvel standalone movies ever released. It hits U.S. theaters on February 16, 2018, arriving as part of the Black History month celebrations. Black Panther stars Chadwick Boseman, Michael B. Jordan, Lupita Nyong'o, Danai Gurira, Martin Freeman, Daniel Kaluuya, Letitia Wright, Winston Duke, with Angela Bassett, with Forest Whitaker, and Andy Serkis. The film is directed by Ryan Coogler and produced by Kevin Feige with Louis D'Esposito, Victoria Alonso, Nate Moore, Jeffrey Chernov and Stan Lee serving as executive producers. Ryan Coogler & Joe Robert Cole wrote the screenplay. In anticipation of the theatrical release of Marvel's Black Panther on February 16, fans can now purchase tickets to the film from Fandango! or any other favorite movie ticketing site. Though if you do choose Fandango as your ticketing destination, they do have a cool incentive. As an added bonus, with every purchase of Black Panther movie tickets, fans will receive a free movie poster exclusively from Fandango FanShop, Fandango's online movie merchandise marketplace. An image of FanShop's exclusive poster by artist Jon Moody can be found below. For a limited time, Black Panther ticket buyers will also receive 10% off all Black Panther film-inspired merchandise from Fandango FanShop, including Funko POP! vinyl figures and plushies, as well as apparel, accessories and much more. According to a Fandango survey of more than 8,000 moviegoers, Marvel's Black Panther was voted as one of the year's top two most anticipated movies, ranking second only to Marvel's Avengers: Infinity War (which includes many of the Black Panther characters). Chadwick Boseman was also voted by the fans as the most anticipated comic book hero in a standalone movie, while co-stars Danai Gurira & Winston Duke were picked among the rising stars of 2018, and Michael B. Jordan as one of 2018's most anticipated screen villains. This latest footage also offers a sneak peek listen to Kendrick Lemar's curated soundtrack. You can check out the new poster and trailer courtesy of Marvel and Disney.